LONDON - The contrast between Europe and America has been back in the national conversation lately, as shocked conservatives look at the recent wave of government bailouts and warn of "European-style socialism" coming to the New World. Behind that reaction is the basic assumption that Europe is a giant welfare state and America is the land of free-market opportunity, where achievement reaps rewards and failures are quickly discarded. But not so fast. Americans, it turns out, are already pretty comfortable with socialism. You don't need to look further than professional sports, which you'd expect to be the most rough-and-tumble, winner-take-all arena of our national landscape. Sports both reflect and embody a culture. It's impossible, for example, to understand Italy and its politics without knowing a lot about soccer and the game's relationship to Silvio Berlusconi - the prime minister and former owner of AC Milan, who converted the team's football chant into a name for his political party. Even the leisurely lawn sport of boules can tell you a great deal about France and the symbolic importance of village life. So if we look at American sports leagues, we'd assume they would be a hard-boiled analogue of our free-market philosophy - a version of on-field Darwinism. Instead, we find, if not exactly a worker's paradise, a safety net impossible to fall through. When it comes to big-time sports, it's Europeans who are the real free-market meritocrats - rewarding success, leaving failure behind, and letting every man fend for himself. By comparison, American professional sports is organized as a giant welfare state, where wealth is shared, luxury spending is taxed and passed to the poor, and even the weakest are never allowed to fail. The contrast is most striking in football. 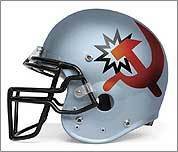 To many abroad, the National Football League is America. And the NFL is about as redistributive an enterprise as one can imagine - a living example of "share and share alike." The league's revenue-sharing provisions mean that its massive television revenues go into a huge pot, which is handed out evenly regardless of success - the bigger, successful teams essentially subsidizing the smaller failures. There are also salary caps, and scheduling and draft mechanisms that empower the poor at the expense of the rich - all in the name of equality, otherwise known as "parity." In basketball, the NBA has a salary cap and a draft similar to the NFL. Even old-fashioned baseball has a luxury tax that distributes money from high-payroll teams to the less free-spending ones. In contrast, as British soccer pundit Gabriele Marcotti has pointed out, it's the Old World's game of soccer where it's every team for itself. European soccer is a multibillion dollar sport, and its clubs are powerful symbols of national and regional identity. And the medium in which they operate is a virtually unfettered free market. With little meaningful central control from the game's governing bodies, owners are free to spend and sign players as they wish - and often do, driving themselves straight into debt and the poorhouse. It's the rich who thrive - unlike here, where a losing squad like Tampa Bay or the Boston Celtics can ride the system straight from nowhere to the top. Americans may have been surprised to learn over the last few months how many companies were deemed "too big to fail," bailed out by a suddenly activist government. But our sports have always been structured on exactly this notion. In the major leagues, everyone is too big to fail. No matter how awful the Detroit Lions are this year - and they look to be in worse shape than General Motors - they'll stay in the NFL and get rebuilt. And so it goes for every loser, both big- and small-time. In contrast, European soccer leagues are built around what one might think of as the "American" concept of promotion and relegation. If a team works hard enough in the European soccer season and wins enough games, it can be promoted to a better league where the salaries are higher. If you fail, you get demoted. The Europeans have instituted survival of the fittest, while our sports leagues embody, well, something that Karl Marx might have preferred instead. Isn't persistence over time an American value? Our professional sports would suggest otherwise. Our championships are decided by a kind of lottery where getting hot at the right time is all that matters. Working hard during the entire 82-game NBA season only gets you to the playoffs with 15 other teams that didn't do as well, with - wow - your reward being an extra home game in a seven-game playoff. In a season of European soccer, on the other hand, it's working hard and consistently over time that really pays off. Sure, there are one-off tournaments, but the most important prize - the league championship - goes to the team that outplays the others in a season stretching months. No playoffs, no wild cards. Jacques Barzun, the cultural critic, once suggested that anyone who really wishes to understand the heart and mind of America should study baseball, with its emphasis on individuality and hard work. And there are many who have made similar arguments about basketball and football. Indeed, we are what we play and how we play it. Which is why, any day now, Rush Limbaugh and Sean Hannity may be moving to France - that bastion of true American values. Steven Stark, a former world sports columnist for the Montreal Gazette, writes frequently about the culture of sports. He is the coauthor of "Starks' Smart Geopolitical Guide to the 2006 World Cup."